This morning Governor Chet Culver will unveil what he’s called a "big and bold" package to rebuild the state’s infrastructure. Culver will deliver the annual "Condition of the State" message this morning at 10 o’clock. This past Friday, during an interview with Radio Iowa, Culver said the state faces a "serious" challenge due to the recession. "But, I’m very hopeful and optimistic that we can work out way out of it, literally, with this focus on infrastructure," Culver said. "We can create jobs, put people to work and keep our economy going." Cedar Rapids Mayor Kay Halloran hopes Culver’s plan includes money for flood recovery in Cedar Rapids. "Not the least of which is money to help us recover our downtown and our major industries," Halloran says. According to the mayor, downtown Cedar Rapids is unable to fully bounce back because the Alliant Energy steam plant which provides electricity to downtown businesses was heavily damaged. "That is necessary for Quaker, Cargill, the two hospitals and I can go on from there, but that gives you the picture," Halloran says. Legislative leaders hope to pass an initial flood relief package in the next few weeks and Halloran wants lawmakers to include incentives that help Alliant Energy restore the damaged steam-powered electric plant. "I understand that the governor wants to have a flood recovery package through the legislature by the end of February or maybe sooner and I applaud whatever speed he can put on that task," Halloran says. Halloran plans to spend a good deal of time in the coming weeks at the statehouse, pleading for state aid for Cedar Rapids flood victims. She’ll be in the audience today, listening to Governor Culver’s "Condition of the State" message. Three members of the Cedar Rapids city council are in Washington, D.C. today and tomorrow, asking federal lawmakers for more flood aid. Halloran says it’s not just her town seeking help from federal and state officials. "We’ve got a list of 390-some cities along the eastern half of the State of Iowa (that) had significant problems," Halloran says. 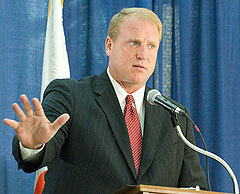 Halloran was sworn in as mayor of Cedar Rapids in January 2006. Halloran also served in the Iowa legislature for 14 years.